<div> tag is used to define division or a section of a html document. The <div> tag is used to group element for styling purpose. The <div> tag supports the Global Attributes and Event Attributes. The <div> tag belongs to Flow content category and palpable content. HTML 4 is support align attribute. HTML 5 is does not support align attribute. <div> tag used to group the <h2> and <p> tag. style attribute is used to set red color for the contents inside the <div> tag. 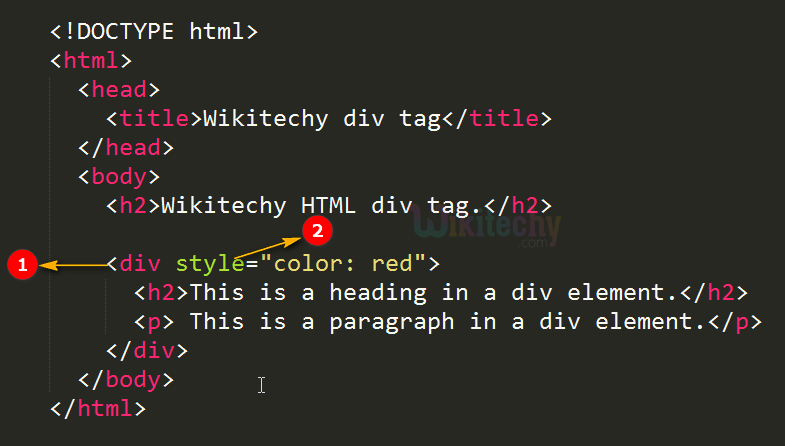 The <h2> tag content “Wikitechy HTML div tag” is displayed in default color (black). The <h2> tag content “This is a heading in a div element.” Is displayed in red color because it is placed inside the <div> which is styled in red color. The <p> tag content “This is a paragraph in a div element.” This also declared inside the <div> tag so this is also colored in red. The <div> element is frequently used together with CSS to layout a webpage.